The Times New Roman: The Many Uses of Vodka! I'm legally blind, so I use vodka as an eyeglasses cleaner. It also works for sunglasses! Lens cleaner solution can get pretty expensive but vodka does the trick for a fraction of the cost! Joan Rivers swears by this trick. She claims that if you put vodka under your arms, you'll never experience foul oder again. She also recommends dousing fancy garments that can't be cleaned in the washer/dryer with a potion of water and vodka. This is apparently an old theatre trick. 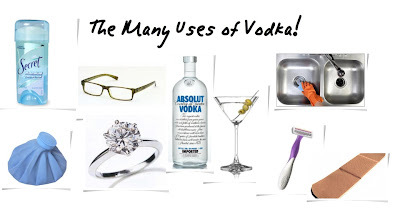 Vodka also removes the smell of cigarettes from clothing. The alcohol content in vodka makes it ideal for keeping razors in pristine condition. If you're looking to extend the shelf life of your favorite set of blades, soak them in vodka for a few minutes and allow to dry. I'm always amazed that vodka doesn't freeze. But if you mix it with a portion of water and throw it in the freezer, it creates the perfect concauction for when you need an ice pack. If you have stainless steel appliances or fixtures, vodka makes for an excellent cleaning solvent. It's safer than most of the products on the market that contain a variety of chemicals and it works just as well if not better at removing stains. If you hate the feeling of ripping a bandage from your skin, douse the area with vodka prior to tugging. Vodka will disolve the adhesive on your bandage, thus making the removal pain free. As mentioned in the tip above, vodka disolves glue and other forms of adhesive. If you have a bumper sticker that doesn't want to come off your car or a label that's on one of your things, vodka will do the trick at removing things smoothly. If your toes and feet are less than fresh, try soaking them in a tub of vodka. This promises to relieve some of the stench. Engagement ring looking a bit dull? Your favorite earrings not catching the light like they used to? Allow me to introduce you to a jewelry cleaner that won't break the bank. Let your gems soak in vodka for a few minutes or douse an old toothbrush in the solution to hand scrub your pieces- voila! Good as new. Vodka can be used to tighten pores by applying after you cleanse your skin. I have very sensitive skin, so I skip this tip, but I've heard that it works great for some people!